Manufacturers and their success strategies have mostly remained the same amidst the changing market scenarios—to create the right products at the right time, without compromising on quality or speed of production. This is exactly where TITAN TECHNOLOGIES has built its reputation on. Backed by its vast industry knowledge and expertise that spans almost a decade, TITAN is bringing sophistication to the manufacturing landscape, streamlining the process— from quote to cash with application integration to Office 365. They are one among the key players in the ecosystem that helps create smart operational workflows within Office 365 and ERP applications—a feat achieved through its unique capabilities in curating fit-to-purpose manufacturing solutions, best-in-class consulting, system integration and implementations. The firm particularly serves small and mid-sized enterprises by building adept manufacturing ERP foundations after iterative analysis and careful assessment of each client’s business objectives and key decision drivers. 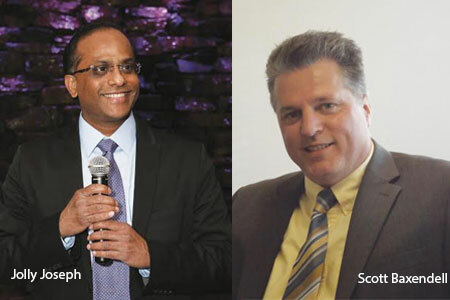 TITAN TECHNOLOGIES ERP services spearheaded by Jolly Joseph, Director and Scott Baxendell, Vice President, both industry veterans driving the clients engagements by clearly understanding their requirements first, and then guiding them in the selection and placement of appropriate solutions. The firm help consolidate overall manufacturing processes, assisting enterprises with expedited project completion and reduced time to market. Right from offering full visibility across processes, production, costing, quality compliance, planning and process scheduling to effectively managing inventory, manufacturing and distribution processes—TITAN TECHNOLOGIES goes beyond just a solution provider to become a trusted partner. Enroute to achieve this, they build all core functionality of manufacturing processes into a single application solution which is presented in a user-friendly, highly customizable format. Underpinning TITAN TECHNOLOGIES’ advanced manufacturing offering is their expertise in implementation of world class ERP applications from vendors such as SAP, Oracle and Microsoft. TITAN TECHNOLOGIES business is driven by its team of experts with extensive industry knowledge and implementation skills in delivering more robust customized solution for its customers, the firm is well positioned to offer manufacturers with full range of services including SAP SME applications, Oracle ERP Cloud applications and Microsoft Office 365 collaboration solutions. The company maintains a similar fashion toward leveraging Microsoft Dynamics 365 and Microsoft Office 365 Collaboration solutions to offer integrated, adaptable business applications across all aspects of manufacturing. This includes automating document workflow and improving financial reporting and analytics, customer relationship, and supply chain management—ultimately delivering business growth and profitability. From selecting the best solution package, navigating through start-to-finish implementation and providing expert IT staff training—TITAN TECHNOLOGIES is a one-stop-shop for manufacturing solutions initiatives. With minimum spent-time for implementation, the firm also has the innate know-how in quickly installing industry-specific enhancements as per the need, aiding customers to proactively respond to the scaling requirements in production. Tailored to streamline manufacturing space further, TITAN TECHNOLOGIES’ al-a-carte model offers bolt-on solutions that can be plugged in to action any time needed—catering to the various ‘out-of-the-box’ requirements that manufacturers usually come across. Over the course of its history TITAN TECHNOLOGIES has served a multitude of clients with numerous successful implementations and trusted post implementation services. Firmly sticking to their unwavering goal of delivering customer satisfaction, the firm is in the good books of enterprises that seek most modern process manufacturing solutions and guidance. With Jolly Joseph pulling the strings from behind, the company is all set to successfully forge ahead—bringing more value to their customers in the coming days.